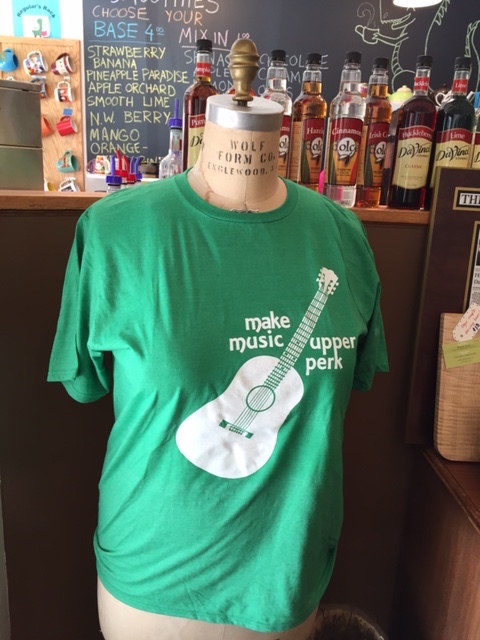 Show your support and pride in our own local music festival by getting and wearing the Make Music Upper Perk t-shirt! We are working on a new design and will be printing new t-shirts as part of our 5th year of celebrating music on the first day of summer in the Upper Perkiomen Valley! We have a few shirts left from our first run of first edition MMUP shirts (limited sizes) that will be available for sale on June 21, 2017, at some music venues. These shirts are made with organic cotton and recycled plastic water bottle and printed locally. The design was created by Ariel Royer.